Much of the country calls this game “duck, duck, goose.” Those people are wrong. Unfortunately, the Vikings' tight end did not grow up here. The first half of the Vikings/Bears game was the equivalent of taking three melatonin pills at kickoff, and the second half was a barrage of five Red Bulls trying to shake off the fog. It was a weird, stupid game in many respects — with the weirdest part being, perhaps, that through it all the Vikings defeated the Bears 20-17 in a game they really needed to win. Not to be overlooked in the chaos, though, was the Vikings’ first touchdown early in the second half. Kyle Rudolph hauled in a pass in the end zone from Case Keenum, and several Minnesota players proceeded to sit in a circle as a celebration began. Rudolph began walking around each of them, playing the game that Minnesotans know as “duck, duck, gray/grey duck.” (I can also confirm that growing up in Grand Forks, N.D., this is what we called the game). Much of the country calls this game, “duck, duck, goose.” Those people, especially those who live in Wisconsin, are sick and wrong. 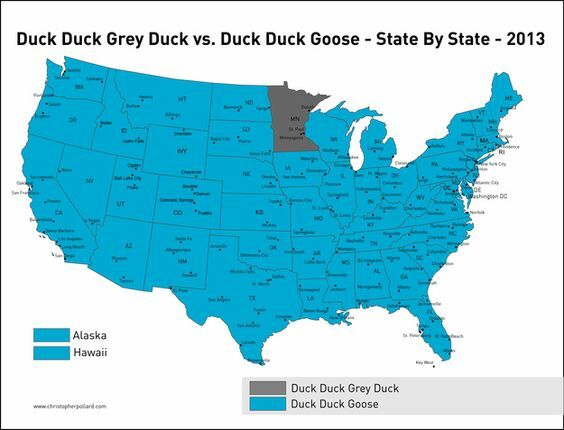 And then KAAA-BBOOOM, social media exploded into gray duck vs. goose debates, like the ones you had when you first met someone from Wisconsin and no longer felt good about the world beyond the St. Croix River. 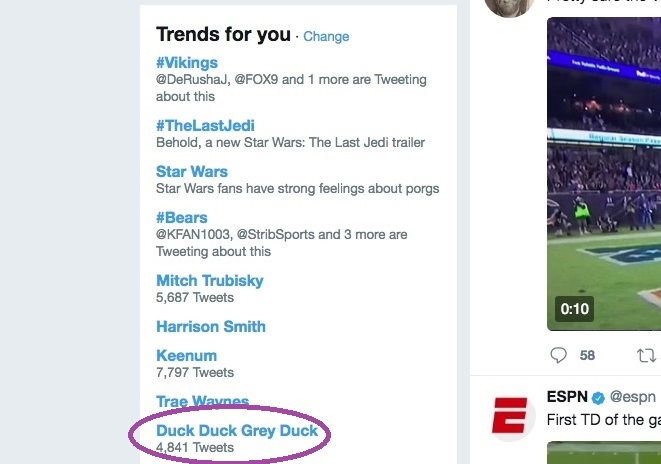 The only debate I am willing to embrace is whether it is spelled “gray” or “grey.” (As you can see by the screen shot above of local trending topics, “grey” appears to be your winner). The rest is so obvious that it’s not even worth the time or effort.